Preparations and innovations are continuing at full speed for the ITM 2020 Exhibition which will host the latest innovations of the leading companies in textile technology. 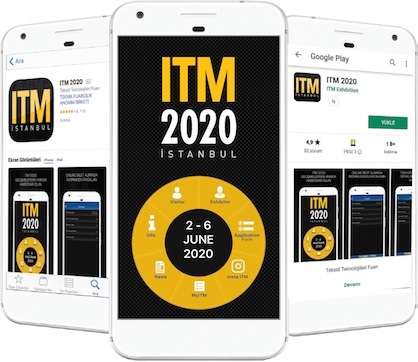 ITM 2020 Mobile application, which will guide the participants and visitors during the exhibition, can also make applications for ITM 2020. IOS and Android users need to fill in the application form in order to apply from ITM 2020 application that can be downloaded from App Store and Google Play. ITM 2020 Application provides many conveniences in terms of its design and functionality. At the same time, the application offers a chance of usage in five languages, especially English, German, Italian and Chinese. ITM 2020 International Textile Machinery Exhibition, organized by Teknik Fairs Inc. and TÜYAP in cooperation will be held next year between 2-6 June. The ITM 2020 Exhibition, which will transform into a show with the participation of industry professionals, exhibitor companies, press members and guests, will last for five days. Many textile machinery leaders will announce their world launches. This great meeting held in Istanbul, where countries are geographically close to each other, will allow sector representatives to introduce their latest technologies in ITM 2020 for the first time. Acting as a bridge between the Eastern and the Western textile worlds, ITM 2020 will continues to take the pulse of the sector as it was in the past years. At ITM 2020, hundreds of manufacturers developing pioneering technologies in the field will turn into a textile technology show with the participation and visit of global investors; from cotton to yarn, from weaving to knitting, from digital printing to dyeing and finishing, all the sub-branches of the sector serving companies will bring together the latest technological products. At ITM 2020, which will turn into a textile technologies show with participation of hundreds of global investors and manufacturers who develop pioneering technologies in the field, companies from all the sub-branches of the sector serving latest technological products from cotton to yarn, weaving, knitting, digital printing, dyeing and finishing, will bring together. ITM exhibitions which are the most important textile technology show of the region, which attended by many companies from home and abroad and visited by thousands of people, is an organization where both national and international companies have realized sales of millions of Euros and many business connections are established.